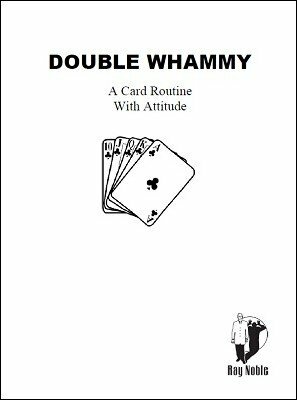 The Double Whammy is a fun and easy card effect that hits hard. I wanted a card routine that I could do anytime with a borrowed deck. This is an effect that will knock their socks off and have them falling on their knees yelling, "He is the chosen one!" Well, maybe not that strong of a guarantee, but an effect that really will show them that you are a magician. I have always had people shout out in excitement at the end of this routine. This is one of the routines that I always do when handed a deck of cards. You are at a party and someone mentions that you are a magician. (HEY, it could happen.) Then some wise guy trying to embarrass you yells out, "Let's see if he is any good. Here use MY DECK!" With a gleam in your eye you tell them "All right, but I don't want to touch the cards. I want you to shuffle the cards until you are 100% sure that they are mixed." Once they have finished mixing the cards, they have another person selected a card. Now this 2nd person mixes the card and the 1st person selects a card from him. Each person signs their cards as you pick up the deck. Each card is then placed back into the deck by the two spectators. So far everything has been done by the two spectators. How could the magician possibly know what cards were selected and signed? He doesn't even know where the cards are in the deck. I have found that people are stunned watching this routine because no one can believe the incredible ending. This wonderful card routine plays off of the Magician in Trouble ploy. Everyone will think that you are really having a terrible and awkward time in finding the signed cards. That is until the very shocking ending when the two helpers lift their hands and find their selected signed cards underneath. This is pure fun entertainment that takes your audiences in one direction and suddenly shifts course and rattles their brains. They will have to catch their breath when the signed cards are revealed. The impossible is possible with The Double Whammy . You will need to know basic card moves to do this routine. A couple are explained but others such as DL, Little finger break, and Dealers grip are not.